Explore diverse new universes of possibility through a variety of creative and fresh new ideas—all in one anthology. From dragons to mythical death dealers, from murder on the moon to deep space mystery, these stories bring you the hot new talent in science fiction, fantasy & horror. Enjoy these award-winning stories & illustrations, with bonus stories by New York Timesbestselling authors Robert J. Sawyer, Todd McCaffrey & L. Ron Hubbard. Learn how to write or improve your craft with tips from Grand Master fantasy author Anne McCaffrey and New York Times bestselling author L. Ron Hubbard. Turnabout—Djinn are famous for twisting your words so they don’t really grant your wish, but two can play that game. A Smokeless and Scorching Fire—Deacon is a government official, and he’s afraid he’ll stay that way if he can’t break his conditioning. The Howler on the Sales Floor—It’s easy making sales when you can send images of despair into the hearts of your clients. The Minarets of An-Zabat—Alder seeks the secrets of the Windcallers’ magic, but his curiosity may destroy the people he loves. The Death Flyer—Jim Bellamy tries to save the life of a girl who died in the wreckage of a train ten years ago. Odd and Ugly—A tree giant takes in a housekeeper, but she has more secrets than either of them can handle. Mara’s Shadow—An ancient myth might provide the key to curing a disease that threatens all of humanity. The Lesson—A lesson on philosophy in action turns into a deadly encounter. What Lies Beneath—A powerful sorcerer has so disgraced himself, he is afraid of what his family will think should he ever die and meet them on the other side. The Face in the Box—Cara discovers a floating farm parked over her land, blocking the sunlight, and must confront the driver. Illusion—Even a court wizard will struggle to fight off armies if his weapons pack no actual punch. A Bitter Thing—You can put an end to something wondrous, but only at a cost. Miss Smokey—Lily’s ability to shift shapes into a bear offers some strange challenges. All Light and Darkness—On a far world, a nameless man meets a woman of ancient genetic stock, and when trouble follows in his wake, he must choose: her life or his humanity? 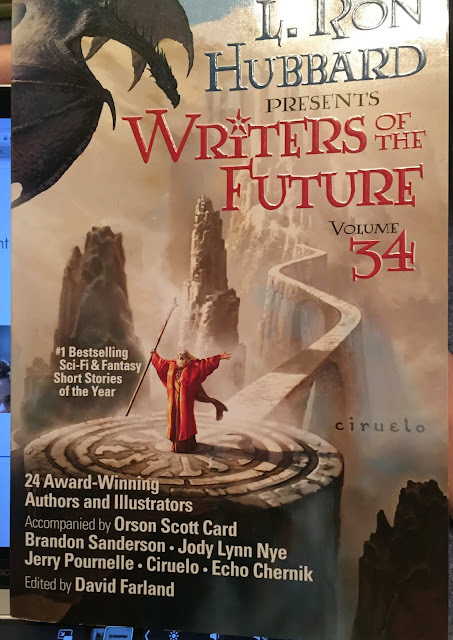 My Thoughts: Before I get into the review, I have to start by saying that I was sent a copy of Writers of the Future Volume 34 so that I could review it, but that this doesn't effect my review in anyway. Now that we have that out of the way... here's to what I think. I absolutely love science fiction writing/movies/television shows, and short stories so I figured I had found a perfect match with this book. Writers of the Future is full of talented up and coming writers and there's a little bit of everything from romance to adventure and horror in these stories. Delightful weekend read that leaves you wanting to read all the other volumes and more from the individual authors.